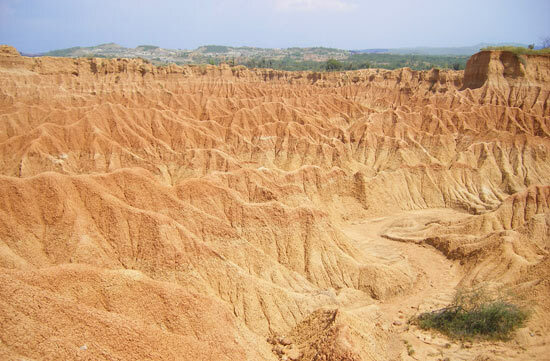 The area in and around the Tatacoa Desert in northern Huila is the driest in Colombia. It's crazy to think that not too many miles away in the same department﻿ there is a snow-capped mountain! But that, in a geographical nutshell, is Colombia! 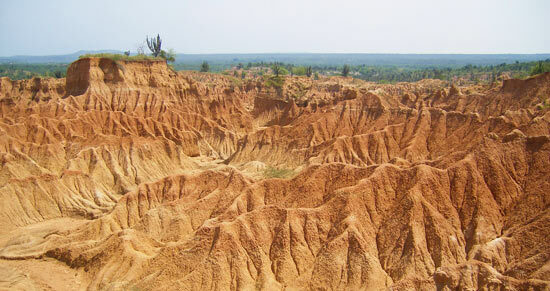 To reach the desert from Huila take a small bus (colectivo) from the bus terminal to the small town of Villavieja. From there you can get a taxi, moto-taxi or minibus to cover the short drive to the desert. 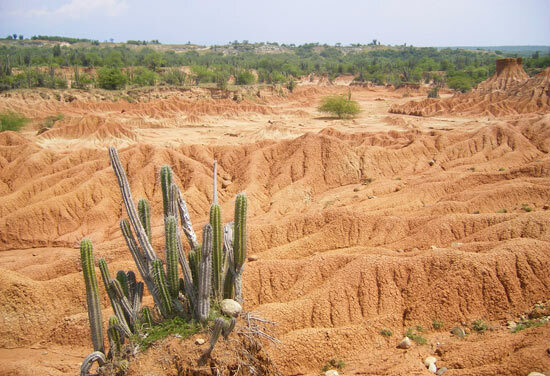 From Neiva the terrain gradually gets more and more arid passing through Villavieja until the vegetation suddenly disappears completely. The vegetation-free area is actually relatively small, but it is quite impressive. Rather than sand, the desert consists of a flaky earth which crumbles underfoot. Cacti dot the foreground with Huila's greener hills off in the distance. There is barely any shelter so sun cream is essential! Despite being incredibly dry, there is some natural water trapped underground in springs. A few of the local hotel owners have created small swimming pools from this spring water - they'll let you take a dip for a small charge. 'Tatacoa' comes from the name of a snake found in the region. If you're feeling a tad peckish after clambering around the desert, the shop by the observatory sells sweets made from cactus! Although not quite to my taste, I did notice others happily scoffing the sweets down so give them a try and make up your own mind! If you have time, I really recommend you spend a night sleeping in the desert. There is virtually no light pollution in the area, so the stars can be seen in all their glory (rarely have I ever seen the Milky Way so clear and bright!). 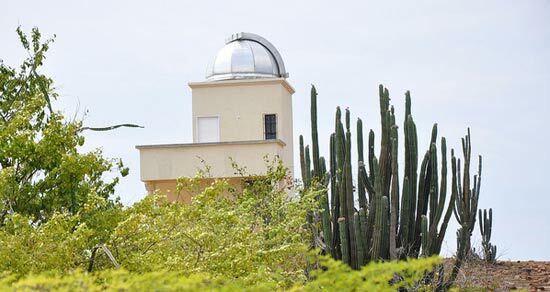 At the side of the main road which passes through the desert is an astronomical observatory. You're allowed to pitch your tent right next to the observatory and enjoy the wonders of the celestial night sky through the lens of the telescope! The telescope is available to use as part of a presentation given by an astronomer in the early evening. There are also a few small hotels/cabins nearby which offer a limited number of rooms. Try one called Noches de Saturno in the sector of the desert called Cuzco. The real treat here is that it has a swimming pool - perfect for cooling off from the desert heat!